The Nortel CVX-1800 is a multiservice access switch designed with top carriers and service providers in mind. Offering a significant port density and universal port functionality, the CVX-1800 is a top option for providers looking to scale their offerings while still maintaining a tight control on overall costs. Wholesale services are a common revenue-driving application that can use a refurbished Nortel CVX-1800, covering commonalities such as VoIP, fax over IP, VPNS, tandem services and high-performance dialing capabilities. For existing Nortel-based networks, the CVX models are interoperable with the SS7 gateway, allowing carriers and service providers to deploy these switches and chassis in an SS7 environment instead of a PRI environment. This can cut costs by up to 50% based on your network and deployment options. Boost your offering with a centralized network control configuration that balances loads, eliminates the need for dedicated physical ports to particular users or service levels, manages multiple SLAs and adapts to three billing models based on your needs. New and used Nortel CVX-1800 units from Worldwide Supply are returned to OEM quality and service levels so that your network can make the most out of its support for more than 2,688 modems per chassis and a four-stack configuration possible in a 7-foot rack. Delivering 10,752 modems per rack has helped the Nortel CVX-1800 stand out for carriers and large operators since 2000. 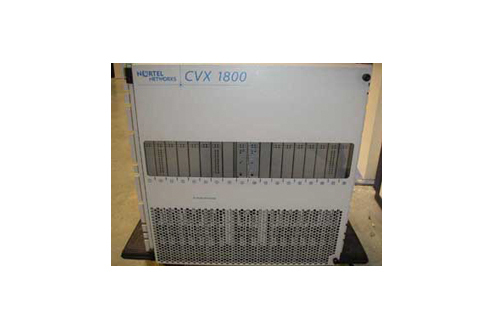 The Nortel CVX-1800 has 18 total chassis slots: Two for the system control cards and 16 that can support digital access cards or modem access cards. The entire chassis supports remote access for monitoring and maintenance with an internal fan module and multiple redundant power supply and interface options. A refurbished Nortel CVX-1800 is a top option for almost any carrier looking to expand their network control and load management.